Mesotherapy is considered to be one of the most contemporary and safe treatments of the Aesthetic Surgery. It is an innovative technique for the cells reformation and renewal, which can provide a totally natural result of the facial features without surgery. Namely, it is a treatment that both prevents and fights the appearance of wrinkles, as well as the decline of the skin’s anti-aging shield. Both environmental and personal behavioral factors are to blame for the signs of aging at a rate of even 80%. The choice of prevention can both slow down the aging damage and remarkably maintain the skin’s quality and health at high levels. What exactly is the face Mesotherapy? Mesotherapy aims to the mesoderm, which is the middle layer of skin. It is a treatment that restores the damages caused by aging and environmental factors onto the skin cells architecture. In order to fully understand the mechanism of action of Mesotherapy, we should first analyze the mechanism of action of the skin cells aging process. We should therefore bear in mind that our skin is similar to that of mammals and consists of three seperate layers: the epidermis, the dermis and the subcutaneous tissue. the subcutaneous tissue is actually the adipose tissue that connects the skin with the underlying tissues. Inside the dermis (i.e. the middle layer of skin) there are cells, named fibroblasts, which are responsible for the production of the skin’s special structural proteins: collagen, elastin and hyaluronic acid. These three substances are macromolecular compounds, which are found in the form of protein chains and are intertwined each other, thus creating the tissue that we recognize as skin. Except for fibroblasts there are also some other cells named fibroclasts, which break down the skin structural molecules. The synthesis and degradation of the skin macromolecular proteins is a dynamic process between fibroblasts and fibroclasts in order to maintain balance and equally break down the produced collagen, elastin and hyaluronic acid molecules. This perpetual exchange process between production and degradation is usually completed within a few hours or days. With age, the fibroblasts degenerate and dwindle in number, resulting in skin loosening and lack of volume and elasticity. Given that the skin structural proteins are extremely hydrophilic molecules, their loss as structural tissue components leads to an image of a dehydrated, thin and fragile skin predisposed to creating wrinkles or atrophy points, as well as deep skin folds. To succeed in boosting the regeneration function, skin cells need vitamins, antioxidants, minerals, enzymes, coenzymes, minerals and amino acids, i.e. substances which – when combined – exert their tissue a high aging action. This is where exactly Mesotherapy takes its role. Using special formulations containing substances with proven anti-aging and regenerative action, we subtly inject (which is an almost painless procedure) these substances exactly in the “tired” skin cell. This way, we achieve in enriching the immediate cellular environment with precious substances for the restoration and regeneration of skin cells. The result is a revived, brighter, healthier and fresher skin. 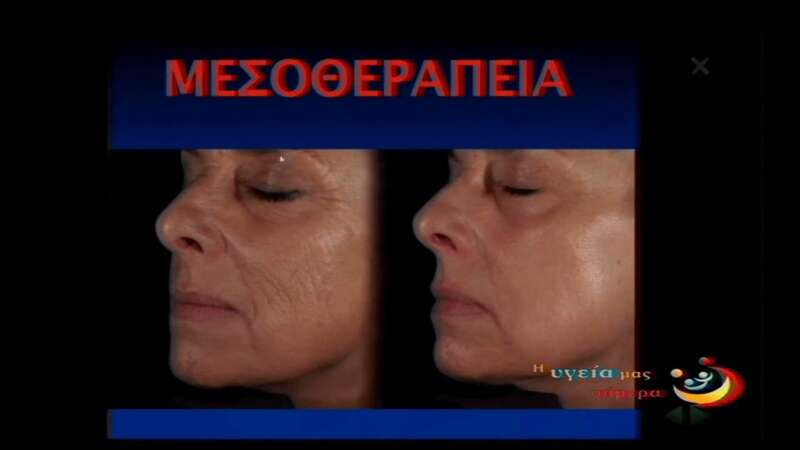 Which substances are contained in the solution of face Mesotherapy? Other substances used in face Mesotherapy are the amino acids, which are important for the protein composition such as collagen, elastin as well as minerals and trace elements which are important factors for the proper function of many enzymes against the free radicals. Also the Mesotherapy solution contains substances such as coenzyme Q10, a powerful antioxidant that contributes in the creation of Vitamin E, Vitamin C and other co-enzymes that result in a smooth functioning of the skin’s cells. Finally, beyond the substances mentioned above, it is necessary to take under consideration the addition of hyaluronic acid (non-reticulated) in the above mixture of substances, which enhance the hydration “from the inside”, which is deeper, as it has the capacity to bind water molecules (up 1000 times its weight) and retain them on the skin. The presence of these substances has an effect on the cells’ metabolism, activating their renewal and maintaining their hydration, thus making the skin look smoother, firmer and less wrinkled. What is the application process of face Mesotherapy? As already mentioned above, Mesotherpy is an injectable treatment. Using a very fine special needle we inject into the mesoderm every 0.3-0.5 cm small amounts of the Mesotherpy solution. These substances contained into the solution pass through the needle into the mesoderm and at this point, based on experimental and clinical studies, activate the cell mechanisms of regeneration and the reverse the aging mechanism, as well. A second application way of these Mesotherapy substances on the face is the Mesoroller, which is a technique of the same philosophy. This is a roller with several tiny needles on its surface rolling on the face surface, after having previously applied the mesotherapy solution on face and though the tiny holes of the roller the solution is absorbed by the dermis. Can Mesotherapy be also applied in the neck? The aging process is unfortunately a phenomenon that generally affects our skin. Mesotherapy is considered to be an anti-aging protective shield, which can be performed as well in the neck, arms and neckline with the exact same purpose: antioxidant action and deep hydration where this is necessary. How long does Mesotherapy take and how often should it be repeated? The treatment lasts 20 minutes. Right after that, a slight redness may appear which subsides immediately. The patient is able to return to his/her daily activities, since make up can cover everything. The treatment is repeated every 7-10 days for the first one and a half month and after that every three to four months, depending on the extent of aging. Mesotherapy is an injectable treatment. Given this fact and because of the Mesotherapy solution, one could assume that it would be a painful treatment – but this does not hold true, because it is completely painless. This happens because the needles used during Mesotherapy treatment are specially designed for this purpose and the application of a special anesthetic cream for about 30-35 minutes, make this treatment completely painless. Is it possible to achieve the same results as Mesotherapy by just using anti-aging creams? There are a lot of creams in the market promising miracles. These creams contain a lot of anti-aging substances which could theoretically provide some results. However, the basic anti-aging substances are macromolecules (i.e. substances with high molecular weight, which cannot pass through the normal skin barrier that protects our skin from environmental factors). The easiest way to get these molecules pass through the skin and be received by the cells where they are necessary, is to bypass the skin barrier and transfer them in the dermis with a mechanical way (i.e via the needles). The Mesotherapy results are unique and irreplaceable, because this is the only way to provide what is absent to the exact point needed. Is it possible to achieve the Mesotherapy results by consuming food supplements that contain hyaluronic acid or collagen? Firstly, the hyaluronic acid or collagen is dissolved in stomach and the intestine by proteolytic enzymes, so it is not possible to be merely transformed in the problematic skin area. Seconldy, after the oral consumption of the hyaluronic acid or collagen, high attenuation of its concentration and action transpire. After intaking food supplements that contain hyaluronic acid or collagen, the substance molecules are distributed to the whole body and only a few really reach the area in need, thus making any improvement actually invisible. On the contrary, the Mesotherapy injections aim exclusively to the under-treatment area ensuring impressive improvement. In an era of constant bombardement by dozens of bleak predictions, one would think that the maintenance and improvement of beauty is some sort of luxury. But this could not be further from the truth. Beauty affects both the aesthetic and psychologic aspect of a person. Therefore, don’t hesitate to visit a specialist thinking that money could constitute an obstacle. The Plastic – Aesthetic Surgery offers fast, easy, effective and affordable methods for excellent results in all ages.